Instructors practicing Critical Pedagogy are active participants in the fight against authoritarian abuses and the promotion of freedom. 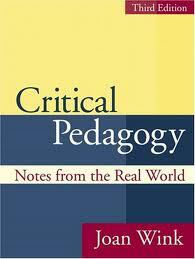 This is a topic suggestion on Critical Pedagogy from Paper Masters. Use this topic or order a custom research paper, written exactly how you need it to be. Instructors practicing critical pedagogy are active participants in the fight against authoritarian abuses and the promotion of freedom. This philosophy of education is explicitly political, coming from a background incorporating a mix of radical views ranging from anarchism to Marxism to feminism. The unifying theme of these background views is combating oppression, whatever its form or context. Although this method of pedagogy is clearly biased, proponents argue that all educational methods are biased toward one political perspective or another. The main founder of this theory is the American-born Henry Giroux. Giroux taught high school for six years before going on to study for his doctorate. Drawing on experiences from his stint teaching in public schools, he began writing about the concept of critical pedagogy as a means of fighting oppression. The eminent philosopher of language John Searle severely criticized Giroux and the paradigm, pointing out that in the end, the real goal of the method is merely to turn students into political radicals. Advocates of the method, of course, do not necessarily consider this portrayal to be a negative. On their view, the world really is full of injustice and the sociopolitical order institutionalizes oppression, racism, and sexism against marginalized peoples. For them, to recognize this fact is in itself a radical act, and an appropriate education is one that enables students to do it. Radicalism is not so much an intended goal as it is a necessary result of the understanding enabled by critical pedagogy. Pedagogy Freire - Pedagogy Freire research papers discuss how Freire hoped to eventually promote radical political reform. Pedagogical Theory and Education - Pedagogical Theory and Education research papers analyze the trends and theory behind the approaches to teaching used in the public education system. Cross Cultural Education - In seeking to navigate the modern world, cross cultural education is a vital tool for any student, and a necessary component for pedagogical success. Women's Studies - While programs vary, most women's studies courses have several common themes, drawing on feminist pedagogy. Wilson Reading System - Wilson Reading System research papers look into the literacy program, based on the Orton-Gillingham principles, designed for children and adults. Adult Learning Theories research papers discuss theories such as Malcolm Knowles theory of andragogy. Order a research paper on adult learning theories from Paper Masters. Andragogy Theory research papers examine the educational strategy designed for adult learners. Teaching Reading Comprehension Strategies research papers discuss strategies that increase the success of reading comprehension in student's. Introduction to Literacy - According to the United Nations Educational, Scientific and Cultural Organization, literacy can be been defined as the ability to identify, understand, interpret, create, communicate and compute using printed and written materials associated with varying contexts. Literacy, Learning, and Teaching Research Papers discuss an order on a literature review of a multicultural education and cultural and linguistic diversity. Standards in Literacy research papers discuss the common standards of literacy that are often identified throughout school districts in the United States. Critical Literacy research papers discuss the use of enabling students to interpret not just the meaning of written words, but also the “underlying messages” in a sentence. Paper Masters writes custom research papers on Critical Pedagogy and explains the active participants in the fight against authoritarian abuses and the promotion of freedom.